© 2012 by Mark Barry All rights reserved; content may not be copied, rewritten, or republished without authors written permission. Cleaning the gutter can be a nasty job and nobody is fond of doing it, yet it has to be done every once in a while, otherwise you risk to have your basement flooded and your walls deteriorated. Basically, in this situation you have two options: you can either clean the gutter all by yourself, or you can Find thousands of unbiased ratings on services for home improvements, car repairs, and more. hire a professional to do it for you. Most house owners choose to ignore the problem of blocked gutters instead of solving it, since it is very messy and it takes time if you do not have the necessary tools to clean them. Nonetheless, this issue must not be ignored due to the fact that it can lead to severe damage to your property. Maintaining gutters clean is essential not only for the overall aspect of your house, but also for preventing any potential water damage that can cost you a little fortune. 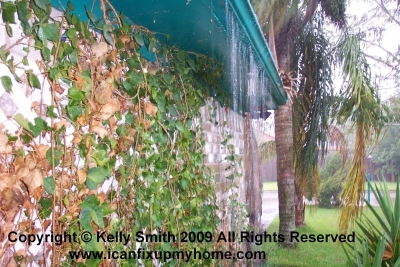 Nobody can say for sure how often you need to remove debris that has accumulated in the rain gutter. This varies based on several factors, such as the vegetation around the house, the weather, as well as the roofing materials. One thing is for sure: whenever water stops flowing through the gutter and it starts gathering in one place, it is certainly time to clean it! If you choose to clean the rain gutter all by yourself, then you certainly need some professional tools to do that. For instance, a high-pressure washer is ideal since it not only removes the debris located in the gutter, but it also cleans it thoroughly. There are a variety of pressure washers available, and most of them come with a telescopic wand that allow you to easily and safely remove leaves and other debris. Special vacuum cleaners can also work like magic and you can use them while you are on the ground. On the other hand, hiring a professional that specializes in gutter cleaning is also a good idea. Not only will they manage to quickly remove the dirt, pine needles, leaves and so on, but they will also do it for a reasonable price and everything is completely insured. In addition, most companies also offer internal cleaning as well and they can be hired not only for houses, but also for commercial buildings and schools. With regards to hiring somebody, this may be the best solution, especially if you have never cleaned rain gutters before. These professionals can unclog and repair rain gutters and besides, they also provide other cleaning services, therefore you can also get rid of the useless things you have gathered throughout years in your back yard. Set up your ladder as safely as possible. Have a helper steady it if at all possible. If you have a 2-story home, it is a good idea to tie off the top. Scrape out the bulk of the debris. A spatula or a small gardening had spade is handy for this. Use your pressure sprayer (or garden hose with spray tip) to wash the remains of the debris down the downspout. Direct the spray directly down into the downspout until it runs completely unimpeded. Check all screws, connections, rivets, etc. and repair as needed. To sum up, clogged gutters can be very harmful and they can cost you a lot of money if they are not cleaned. In a heavy downpour they can actually pull away from the fascia board, incurring costly repairs. Unfortunately, people realize the importance of cleaning them only when it is too late and they start to notice leaks and water caused damage on the walls of their house. Since it is always better to prevent than to treat, it is highly recommended to clean the gutters regularly in order to allow rain water flow properly. Article © 2012 Mark Barry All rights reserved; content may not be copied, rewritten, or republished without authors written permission.